Wind turbines used for electrical generation primarily come in two design variants (horizontal axis and vertical axis) and three size classifications (utility, community, and distributed). Horizontal axis: Horizontal axis turbines are the most common type of wind turbine used for electricity generation today. They typically consist of a tower mounted 3-bladed turbine whose drive shaft and blades spin on the horizontal axis and must be positioned into the wind in order to work properly. Vertical axis: Vertical axis turbines have their main rotor drive shaft and blades positioned vertically such that they do not need to be positioned into the wind to function properly. Utility scale: Utility scale wind turbines are typically very large 3 bladed horizontal axis turbines that feed power directly into the grid/local utility through a bilaterally negotiated Purchase Power Agreement (PPA). They typically produce 1 MW or more of energy and have become one of the most popular and cost effective forms of renewable energy today. Community scale: Community scale wind turbines are smaller than their utility scale turbines, but typically too large to be sighted on a single residential property. 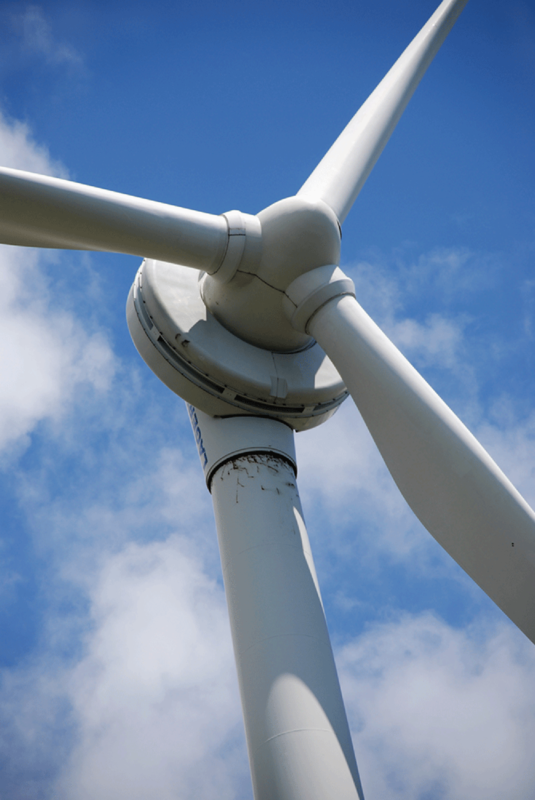 Community wind turbines are typically larger than 100 kW and smaller than 1MW. Community wind turbines are best suited for rural areas where they either sell energy to the local utility via a PPA or utilize a standardized Feed-In-Tariff (FIT) program. They can also be used to power industrial/agricultural process such as water pumping and or refrigeration. Distributed scale: Distributed scale wind turbines are the smallest of all turbines used for electricity generation, typically ranging in size from as little as 2 kW up to 100 kW. Distributed Generation (DG) energy is either used on site or very close to the generation source. Most renewable DG comes from either small scale solar or wind systems that are sited on residential or commercial buildings, designed to offset the facilities existing load. In Hawaii most DG is in the form of rooftop solar, interconnecting to the utility through a Net Energy Metering (NEM) Agreement or a standardized FIT agreement. The vast majority of wind capacity installed in Hawaii is utility scale horizontal axis turbines. This page has information concerning land use laws and regulations as well as information on endangered and threatened species and the habitat conservation plans used to mitigate for takes often associated with wind development.